New Patient Center at Peeks Chiropractic, P.C. Welcome to Peeks Chiropractic, P.C.! We look forward to meeting you. If you’d like to complete your new patient paperwork ahead of time, you can download these forms from our website and bring them in completed. You’re also welcome to fill them out after you’ve arrived for your first appointment. You’ll sit down with Dr. Peeks to talk about your health history, the symptoms you’ve been experiencing and exactly where it hurts. He’ll determine which X-rays are needed and take them at our on-site facility. While they develop, Dr. Peeks will do any further examination that’s necessary and use the Dermathermograph. This infrared device assists in identifying any problem areas by measuring the temperature along your spine. Your X-rays will be initially analyzed immediately. If we believe you’re a candidate for chiropractic care, Dr. Peeks will start you on your chiropractic journey and address the cause of your pain with a chiropractic adjustment. If necessary, you will receive appropriate PT. 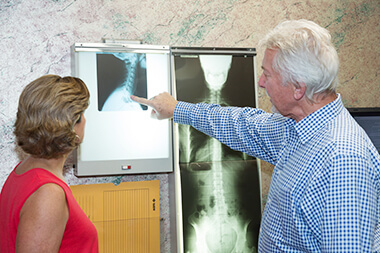 By testing before and after your adjustment, Dr. Peeks ensures that the exact corrections you need are performed. When you call to make an appointment, we like to get your insurance information over the phone. Then, we will call your insurance company to verify your coverage before you arrive. If you’d like to know the particulars of your plan, contact us today, and our team will be happy to help you. We accept many different insurances. Discover why Peeks Chiropractic, P.C. was voted Best Chiropractic Office in Johnson City in 2010, 2011, 2012, 2016 and 2017. Reach out to us to schedule your appointment with Dr. Peeks!